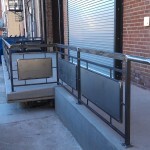 ALL PHOTOS IN THIS GALLERY ARE ACTUAL JOBS COMPLETED BY SD METALWORKS, LLC. We offer a variety of commercial products for a range of industries. Contact us for a free quote on your project.